The Florida gun law that prohibits convicted felons from possessing a gun in Jacksonville is Florida Statute 790.23. This Florida gun law makes it a felony crime for a person that has ever been previously convicted or adjudicated guilty of a felony to possess a firearm in the state of Florida. According to Florida Statute Section 790.23, a person that has previously been convicted of a felony cannot possess a firearm. The Florida jury instruction for Jacksonville possession of a firearm by a convicted felon is Section 10.15 and states that the Jacksonville prosecutor must show that the convicted felon had in his care, custody, possession, or control a firearm, electric weapon/device, or ammunition. If you are going to trial for possessing a gun in Florida as a convicted felon, the state must prove the crime. It does not matter if you were arrested for this Florida gun crime in Duval, Clay, Nassau, or St. Johns County; the Florida firearms laws are the same. A Jacksonville convicted felon can actually or constructively possess a firearm. 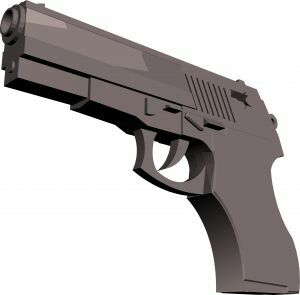 When you are talking about a Florida felon possessing a gun, actual possession occurs when the firearm is on the convicted felon’s person or so close that it is readily within his or her reach. Just because the firearm is very close to the convicted felon, there is no actual possession of the firearm if he or she is not in a position to exercise control over it. A convicted felon is in constructive possession if the firearm is located in a place that the felon has concealed the firearm or a place that the felon has control over. In some Jacksonville possession of a firearm by a convicted felon cases, a felon is arrested in Jacksonville for possessing his or her spouse’s firearm. In most of those Florida gun cases, the spouse keeps the firearm in a non-secure location in the house. This location is normally a place that the felon has access to, so the felon is arrested for possession of a firearm by a convicted felon in Jacksonville. A Jacksonville Gun Lawyer can defend this case based upon the fact that the felon may not have been aware that the firearm was located within the house. If the spouse keeps the gun in a secure location that the felon does not have access to and could never gain access to the gun, the convicted felon would not have any ability to control the firearm and could not be in possession of it. For example, the wife keeps her gun in a safe in the house. The safe is bolted down to the floor in a room that is kept locked. Her husband is a convicted felon in Jacksonville, Florida. He does not know the combination to the gun safe and does not have a key to the room. It would be absurd to believe that he guilty of constructive possession of the gun in Jacksonville. If the gun is kept in a box in the bedroom closet that both people share, the Florida prosecutor would have a better argument that the Jacksonville convicted felon was in possession of the firearm. I am in no way stating that storing a firearm in the manner provided above will result in a Jacksonville convicted felon not being arrested and charged with Jacksonville possession of a firearm by a convicted felon, but it would create a defense to the Florida gun charge. This would give a Jacksonville criminal defense attorney a better change at winning the case or getting charges dropped.